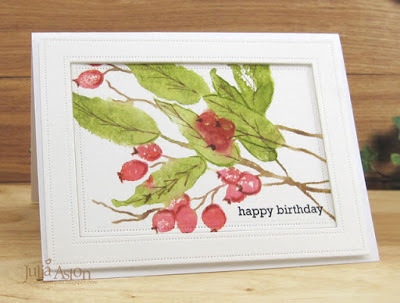 I made another card for the CAS Mix Up Challenge which is inking our stamps with markers. Here are a few photos of how I inked my stamp with markers. I placed a piece of watercolor paper in my Tim Holtz Stamp Platform, lined up my stamp on the paper and then closed the platform so the cover would lift up the stamp. So first, I colored the stem areas with my Gathered Twigs Distress Marker. 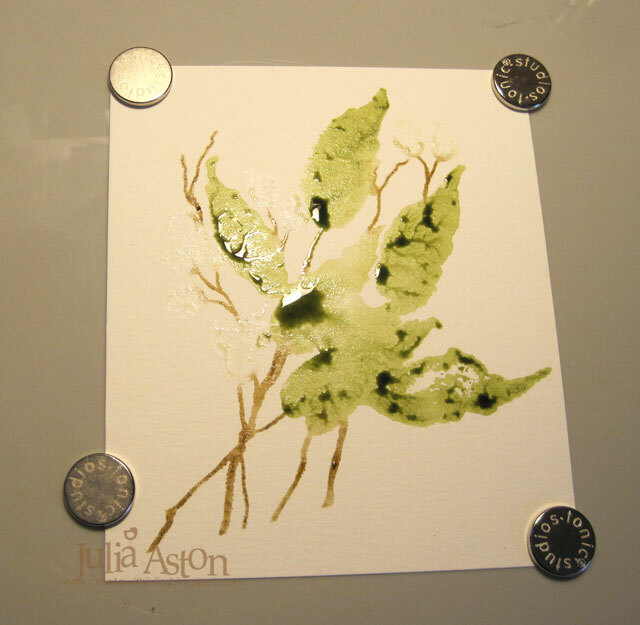 I misted the stamp with water and stamped it onto the watercolor paper. I wiped off my stamp and then colored the green leave parts with my Peeled Paint Distress Marker. I misted the green on my stamp a little too heavy (!) and I had pools of color when I lifted the stamp off. 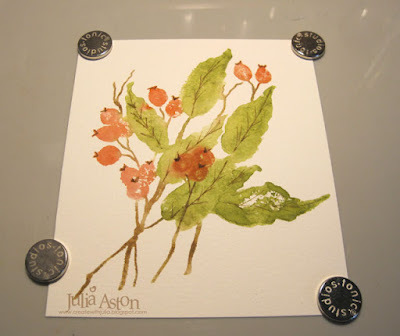 So I dabbed gently with a paper towel to lift off some of the water, being careful not to go out of the image area, and then I dried it a bit with my heat tool before moving on to the red berries. I die cut the panel with Pierced Feature Frames from PTI and just used the middle piece with the image (some of my image showed on the outer frame since the image was big). I stamped the happy birthday in the corner with black ink. I used the die again to cut a plain watercolor paper frame and layered it to the card base with foam dots. Then I adhered the image inside the frame so it's recessed. This was a large image - so I made it CAS by die cutting it into a smaller panel and framing it in white. So please join us and show us how YOU ink your stamps with markers! You'll find lots of inspiration from the talented Design Team as well as our wonderful September Guest Design Team member Chrissie (Simply One of a Kind). 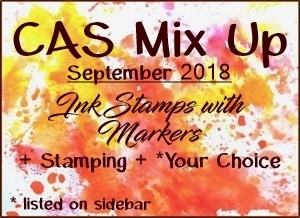 You'll also find technique videos at the CAS Mix Up blog! You have until Sept 24th to link up your CAS card! I need a lot more practice with this technique - but it's fun to try different stamps and see how they look when "inked with markers"! Accessories: Ranger Distress Markers Peeled Paint, Red Brick, Gathered Twigs, Pierced Feature Frames Dies - PTI, Tim Holtz Stamp Platform - Tonic, water mister, foam dots. 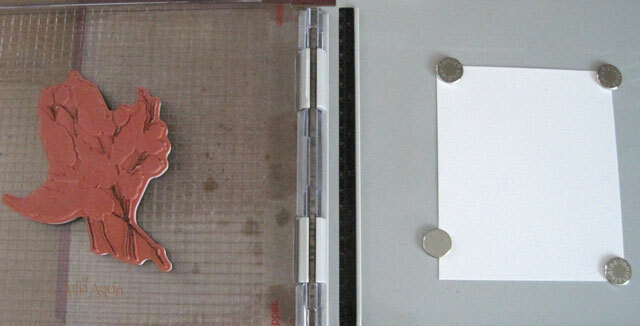 Great idea to frame the stamping/card and make it CAS. Thank you for the step by steps and the photos along the way. Wonderful card Julia and a great stamp to do this technique with. Thank you too for the inspiration to colour the stamps up colour by colour as opposed to doing it all at once. Such a beautiful card x. Thanks for explaining it step by step. 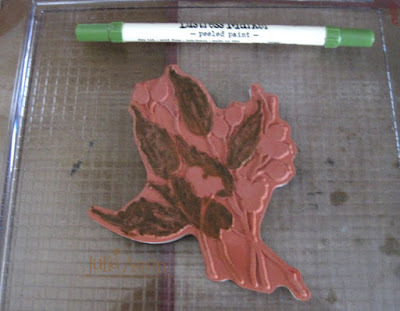 I don't yet have a stamping platform - but I use almost exclusively acrylic/photopolymer stamps so I can usually set them down in the same place twice. At first glance I thought you might have done the no-line stamping (I think that's what it's called!) where you stamp in a very light color and then watercolor over it. Your way seems a lot faster and has the benefit of being possible to recreate! I do love your card - excellent work!!! This is beautiful, Julia! 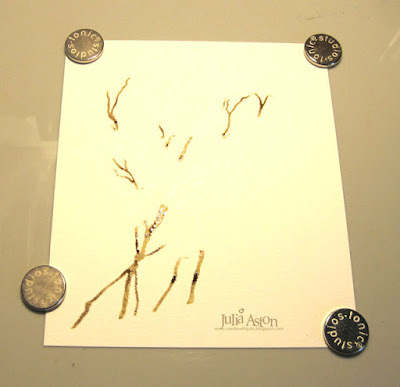 It is a large image and perfect for this technique! I love how you've recessed it in the frame! Altogether beautiful, my friend! Thanks so much for sharing it with CAS Mix Up! This is one of my favorite PB flower images, Julia. It is not easy to color because of all the details, but you did great fudging a bit with your marker for the veins, etc. I am sure your photos helped our followers that have never done this marker watercoloring technique. TFS the photos and your beautiful card, my friend. Hugs.. This is so beautiful, Julia! You did a fabulous job with the inking with markers technique. Love the way how you kept the card CAS. Your step-by-step photo tutorial is always useful. Thank you so much for taking the time to show it for us!